Miss Temple City (Temple City – Glittering Tax) will run in the G1 Queen Anne Stakes on Tuesday, June 20. Post time is 9:30am EST, and you can view entries here. This will be her third trip to Royal Ascot. See the Day One Preview here. 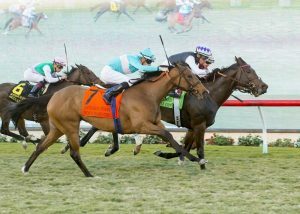 In a 2016 campaign marked by two G1 victories over male opponents, Miss Temple City continued on her historic year proving why she was the favorite in the G1 Matriarch Stakes at Del Mar Racetrack, her most recent win, which marked the filly’s third G1 victory of 2016 and first amongst female opponents. Watch the replay here. To date, Miss Temple City posts a 16-6-3-2 career record. All of the partners – The Club Racing LLC, Needle In A Haystack, LLC and Sagamore Farm – are excited for the G1 Queen Anne Stakes!